TSN reporter Mark Masters checks in daily with news and notes on Team Canada. Head coach Tim Hunter held a media availability ahead of today's quarterfinal showdown with Finland. Tim Hunter has no interest in engaging with Juss​i Ahokas. Finland’s coach suggested Tuesday that his team will be playing free and loose as the underdog in the quarterfinals while Canada may struggle with the pressure of being the favourite on home ice. 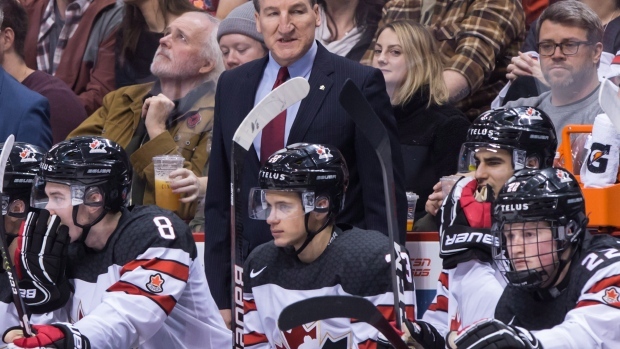 "I'm not concerned with what the other coach said," Team Canada's bench boss shot back when asked about the comments. How would Hunter assess his team's mindset entering their first elimination game as a group? "Oh, we'll be ready. I told the team last night, 'It's been a process to this point, getting better every day as a group, building chemistry and they're going to be ready to play.'" The truth is neither team is especially thrilled with how they enter this do-or-die showdown. Finland lost 4-1 to the Americans on New Year’s Eve while Canada fell 2-1 against Russia. "Each team seems to go through a period of, I don’t know if you’d call it undisciplined hockey or taking penalties or what you want to call it," Hunter said. "The Russians did it before they played us and they cleaned their game up and were pretty disciplined. We did it last year against the Americans and it cost us a game, but we still won our pool. You get it out of your way." Hunter was pleased that his team only allowed eight scoring chances against the Russians with only four coming after a sluggish first period. "We still outchanced them," Hunter said, noting Canada had 11 opportunities. "They didn't get a scoring chance in the second period and we had a chance right to the end to tie the game. We played our game a lot and had a lot of success. The places we didn’t have success last night is when we deviated from the plan. We had guys shooting the puck at the net and we had nobody at the net. There’s a process to scoring goals and we have to stick to that process and we got away from it. "These guys are like the Russians. They'll sell out to block shots so we have to get them down and then move our feet to get shots through." Finland, meanwhile, managed just two goals in their games against the Swedes and Americans. "We have to score better," Ahokas said. "We've had a ton of chances, but we have to be more efficient. That's the biggest thing. All of our top guys, they've been waiting and now the games start." Canada lost to Finland 5-2 in a pre-competition game on Dec. 23. What did they learn? "We let them skate around us pretty much the whole game and that's why we lost," said captain Maxime Comtois, who called his performance that night the worst of the season. "We watched some clips about that game and we want to do better." "It's good that we played them," said Canada's leading scorer Morgan Frost, "because we kind of know what to expect now. We have a game plan going in and now we just have to execute it." "We played well as a five-man unit," recalled Ahokas. "We had a good start. It was a long time ago, but it builds our confidence that we won that game." Despite the loss, Canada was dominant for about six minutes in the second period, hemming the Finns in their own zone. Before the tournament started, Hunter showed that video to his players using it as an example of what they can do when they’re playing their game perfectly. "We were playing the Canadian way," said Comtois. "We were skating hard. We were good on the forecheck. We had some fast changes, also, to keep the pressure on them. We moved the puck around, we crashed the net and that’s the type of game we want to bring." Frost is very familiar with Ukko-Pekka Luukkonen, who plays for the Sudbury Wolves in the OHL. Frost, who has 58 points in 32 games with Sault Ste. Marie this season, scored on the Finnish goalie on Nov. 21. "It was a breakaway goal. I’d love to get a breakaway chance in this game," Frost recalled with a smile. "I shot, actually, which is not that typical of me. Usually I'll make a deke and then shoot or something. I shot it from pretty far out to try and catch him by surprise." "I was surprised," Luukkonen admits, "but I will be ready this time. He's one of the more skilled guys on their team and a real good playmaker." Greyhounds centre Barrett Hayton also scored in that game. Meanwhile, Mississauga's Owen Tippett has scored on Luukkonen four times this season. "His wrist shot is really quick and sometimes you don’t expect him to shoot, but he shoots," Luukkonen said. "He shoots sometimes from anywhere so you have to be ready for it." Luukkonen did shut out Tippett and the Steelheads in their most recent matchup of the season. Four of the seven goals Luukkonen has allowed at the World Juniors have come with Finland shorthanded, so special teams could be a huge factor in the quarterfinals. Canada’s power play failed to score against Russia and has been inconsistent so far ranking seventh out of the 10 teams. "We had some good looks," Hunter insisted. "We had a couple great looks with the goalie out and it’s a fine line between winning and losing." Canada's coach did acknowledge he will make some small adjustments to the tactics with the units based on how the Finns like to kill penalties.